Beat the dealer with card count total of 21 or less. Black Jack is a game where the participants play against the Dealer (the bank) independent of other players. The player’s goal is to draw cards which together should amount to 21 scores, or as close as possible without overstepping 21. When the player gets 21 with his two first cards, he has Black Jack. Ace counts as 1 or 11, dressed cards as 10 and remaining cards according to their value. If the player’s sum of cards is closer to 21 than the dealer’s, he wins as much as he has put on stake, except when he has Black Jack. In that case the player wins 3 to 2 times what he bet (assuming the dealer does not also have Black Jack). If the player’s sum of cards is overstepping 21 he looses what he put on stake. If the player and the dealer have the same scores from 20 and onward, no one wins and the stake goes back to the player in a so-called push. Black Jack beats 21. Split, if the player’s first two cards are of the same value, he may split them and with a new stake of the same value, he gets two separate hands. The player draws cards in accordance to regular rules. If the player splits two Aces, he only gets one card each on respectively ace, then the dealer draws his cards. If the player splits and gets 21 with 2 cards on any hand, this is not considered as Black Jack, but as 21. Double Down, it is possible for the player to double his stake, but he will only receive one more card. The player may double on his two first cards. Double down is done when the player thinks his third card will give him a position where he can win over the dealer. Insurance, if the dealer’s first card is an Ace he is then considered to have good chance to get Black Jack. The player can, if he believes the bank’s dark card is a 10, insure himself against Black Jack. If you choose to insure yourself you have to pay an amount of half your stake. If the dealer gets Black Jack, the insurance will pay 2 to 1 which corresponds to the original stake. If you have insured yourself and the dealer does not get Black Jack then you loose you’re insurance. Your ordinary stake is settled by your cards against whatever the bank gets. The insurance is to be seen as a game of its own within the Black Jack, and it gives the player a chance to protect himself, when he thinks that the dealer will get Black Jack. 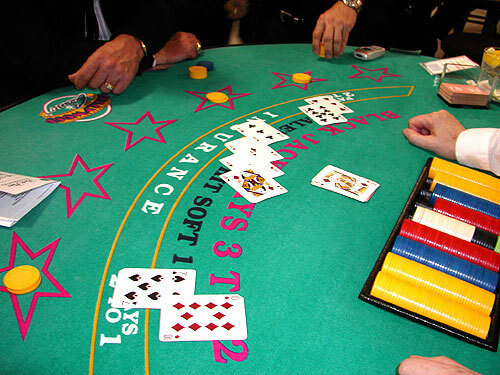 The player should not insure himself when he has Black Jack. If the dealer gets Black Jack towards your Black Jack a push is obtained. The dealer must draw cards until he has at least 17 and must stay on 17 or higher. In other words, if the dealer gets 16 he has to draw a card. The dealer has no freedom to draw cards depending on your hand. The dealer follows given rules and can not act on his own. The following demonstrates possibilities to stop, draw, split and double down. There are many ways to play. The strategy we show here is to be seen as a guide to the inexperienced player. When you have learned the basic rules, you will develop your own strategies. The fact that you play in different ways, some better – some worse, is what makes some to win a lot of money and some to loose. Our last advice to everyone playing Black Jack, is to play consequently and become a winner. * a soft 17 refers to a hand in which an Ace is considered as eleven plus a 6. Here you have the advantage of being able to re-consider the Ace as to one, after drawing another card and you will have a hard hand. Remember that it may be risky to double, You only get one card when double down. After that the dealer draws his cards. The bank wins on 17, 18 and 19 if the player has the same value.